Blacknoise Germany is a company that has decided to specialise in fan and silent technology. Under the NOISEBLOCKER brand Blacknoise Germany develops and markets fans and accessories for reducing the noise produced by PCs, IT technology and electronic products. The core of the company is a small group of employees who have devoted themselves to this theme out of passion and commitment. Also with this series we only use high-quality units and long life bearings. Perfectly on silent PC’s co-ordinated numbers of revolutions for almost noiseless operation. All three of the Noiseblocker fans arrive in similarly styled blue, black and silver packaging. The front of each dictates the fans specifications (size, voltage, airflow and noise). Seated in the vacuum formed plastic is the fan of course and it’s accessories. The rear of the cardboard backing for each fan has the detailed specifications listed in German and English and some manufacturer contact information. It’s good to see Noiseblocker offering direct contact info; many companies do not offer this type of support. Included with each fan are simply four blue rubber anti-vibration pegs. These are useful for dampening vibrations between chassis and fan. N.B. I will be conducting the product review on just one of the fans from this collection as all three are identical – bar minor features like the sticker on the centre of the impeller and the connector type. The shape of Black Silent fans are of the standard square form and the frame dictates this. Where the mounting holes are located at each corner, the thickness of the plastic is 4mm; this is slightly thicker than most fans and means it’s highly unlikely that the corners will snap off – which is the case with some cheaper fans. Altogether there are seven blades situated on the compeller – this is the usual amount with 120mm case fans. The blades have been spiced up a bit in terms of aesthetics though; they carry a translucent purple blade design. This colour scheme is one I’m not familiar with and so definitely creates a unique appearance for the Black Silent fans. The whole impeller of the XL1, XL2 and XLS is indeed very smooth. This aids in allowing the Black Silent fans to create much less turbulence, producing much less noise. However, a silky smooth fan blade attracts dust like a magnet and so will need to be cleaned. The centre of the compeller has a sticker which happily advertises Noiseblocker and boasts the model of fan. This sticker hides the nut which secures the compeller to the motor below. At the rear of the fan, the same sticker resides at the centre. The motor and compeller is held firmly in place by four struts which hang from each corner. To test the strength of these, I had a good go at trying to snap one with my bare hand. However my strength was shameful here, with me not being able to. Powering the XL1 and XL2 fans are the standard 3-pin connector. For the XLP fan however, a 4-pin PWM connector has been used. As the anti-vibration pegs included are slightly longer than most, installing the fan to the rear of my Lian Li case was very simple. I then attached the connector for the fan to an available header on my motherboard. In order to put the Noiseblocker BlackSilent series to the test, I chose to test all of the fans provided as well as comparing them to some tough opposition – the Xthermal BTF120PRO. As with all fans, I disconnected all the fans in my case (bar the CPU and GFX cards) and then only hooked up the fan which was to be tested, taking readings from both the CPU and system temperatures. Ambient temperature was 18 degrees and the CPU Cooler used was the Intel Stock (copper base version), all fans ran at 1241 RPM. In all instances we can see that the Black Silent fans have produced much lower temperatures than the Xthermal fan. I’m quite surprised by this as the Xthermal is a tough cookie in itself, so Noiseblocker have done well to beat this. What’s also very surprising is the CPU temperature drop; we can see an extortionate 5 degree drop. This is pretty impressive to say the least. What we can also see is the XL1 and XL2 fans only differing by as much as two degrees – one degree in most cases. For the noise level difference – I’ll explain later – you might as well go with the lower dBA fan (the XL2) as there’s little difference in terms of performance. Also noticeable is the XLP which boasts to be the best of both worlds – noise and airflow. This performed greatly in the airflow tests, sharing its results with both the XL1 and XL2. The results in this sector are hardly surprising. The XL2 of course was the loudest, followed by the XLP and then the XL1. This proves the XLP to really be the best of both worlds. 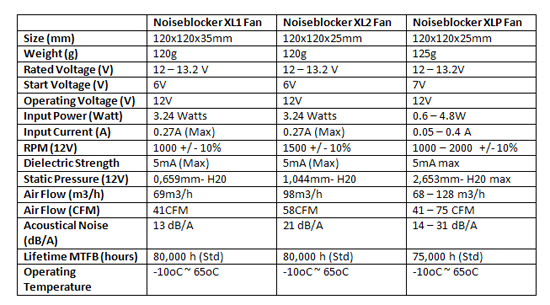 However, the noise level difference between the XLP and XL1 was quite a large one. The XL1 was more-or-less inaudible when mounted in my chassis. The XLP and XL2 however were much louder… I’d go as far as saying the XLP made the same amount of noise as the Intel Stock Cooler at full belt. However, when using the XLP at maximum RPM and not at 1241 rpm – which we tested all the fans at – the XLP was then the loudest. The XL1 retails at £7.50, the XL2 at £8 and the XLP at £8.50. For performance case fans like these, this is a little lower than the average price. Therefore, these fans are definitely worth the buck. From this review we can see that Noiseblocker Black Silent fans are definitely a good choice when buying a performance cooling solution for your much loved rig. I’m not too keen on the XL1 or XLP fans as there’s little performance gain from those when compared with the XL2. However if you’re the type of user where every degree counts, you’d probably much rather go for the XL2 or XLP. But for noise conscious system builders, the XL1 is definitely the best choice. Thanks go to Noiseblocker for providing the fan series for review.